About the Ride: BAM 2019 will be a loop tour beginning and ending in St. Joseph, Minnesota. Host communities along the way include Sauk Centre, Spicer, and Hutchinson. Minnesota’s central lakes area offers incredible views and much to explore. 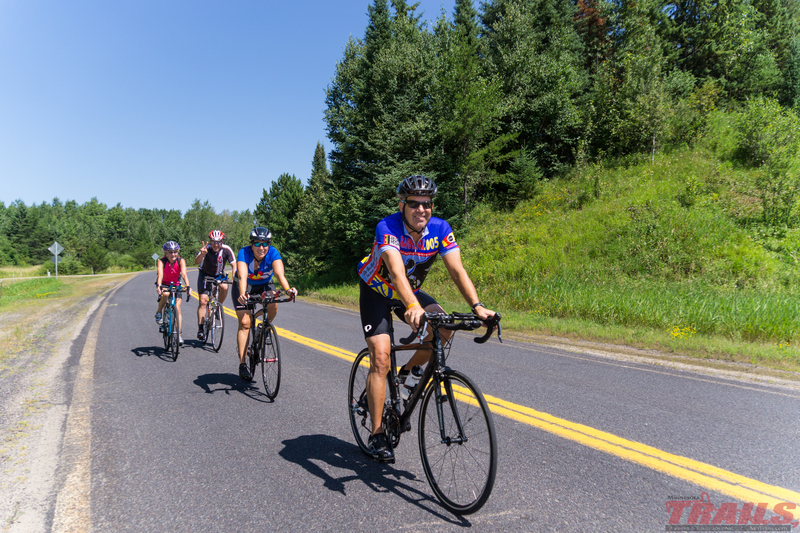 Each day cyclists will ride between 60 to 70 miles on paved roadways and trails. The ride is expected to fill quickly, so be sure to register early. There is a 275-rider limit. Mileage & Terrain: Mileage will range from 60-70 miles/day on paved roads and trails. The terrain in this area is generally gently rolling with some hillier sections interspersed throughout. The tour is designed for cyclists of intermediate ability and above. Cost: The cost for BAM is $325 and includes 4 nights camping, 4 breakfasts, 4 lunches, 2 dinners, baggage transport to each night’s destination, maps, SAG and mechanical support and all the scenery and fun you can pack in! All other fees are on your own. There are no discounts for group registrations. Food and Rest Stops: Beginning on the first day, BAM will provide 4 breakfasts, 4 lunches, and 2 dinners. Riders will be on their own for dinner on Saturday evening. Lunches will be served on the road at the halfway point or later each day. Only breakfast and lunch will be provided on the last day. Meals are served by a combination of local community/civic groups, caterers and restaurants. Because there are numerous dietary considerations among riders, BAM will publish the menus for each meal in advance of our first day of riding. If you have special dietary needs, please review these menus and plan accordingly for what you may need. Supported rest stops are not part of this ride, however, there are opportunities every 15-25 miles to stop in small towns to rest and get something to snack on from convenience stores, ice cream and coffee shops, & cafes. Camping: This is primarily a tent camping tour, with limited hotel options available (see below.) Camping is at local parks, schools, etc., with a Pork Belly Ventures shower truck available onsite with ample private stalls, hot water and free towel service! If you’d prefer to avoid the hassle of setting up and taking down your tent, Pork Belly Ventures offers an optional Tent Setup Service. For $250 per tent, they will provide a tent, air mattress, chair, as well as all set up and take down and delivery of bags to and from the luggage truck. Riders have access to plenty of mobile phone chargers at the campsite and fresh Dunkin’ Donuts coffee is available at the campsite for all riders each morning. Motel Lodging: For those who prefer indoor lodging, there are a limited number of motel rooms available in each city. The motels may be 1-4 miles from the camping location and riders are responsible for getting themselves to and from the motels as well as to meals and town activities. BAM does not vet the motels. The BAM block of rooms will be held at locations mentioned until June 1, 2019. See the list of motel lodging here. Make your reservations now. The cost of motels is not included in the registration fee and it is your responsibility to make your own reservations. A list of hotels/motels will be available here when registration opens. Be sure to make reservations at these properties only, as these are the only locations that luggage will be delivered to and picked up from. Luggage Transport, SAG and Mechanical Support: A vehicle will transport your luggage each day to the next overnight town. Campers are allowed two soft-sided bags, limited to 35 lbs each, and hoteliers are allowed one soft-sided bag, limited to 35 lbs. Please be sure all items fit inside your bag(s); no tie-ons please. All bags will be weighed prior to being loaded onto the luggage truck; bags that don’t meet the requirements above will not be loaded. SAG support will be provided and is for people who have mechanical issues that cannot be repaired on the road or are injured. SAG support will not be available as a transport mechanism for tired riders. Please be prepared to bike the distances indicated on the ‘Routes’ page. Mechanical support is provided by Penn Cycle, so all you need to do is ride your bike! Penn provides the service, however, you’ll need to pay for parts, etc. Please be sure to have your bike tuned up before arriving on the ride. Non-Riders: BAM will allow up to 10 non-rider participants on the tour. A non-rider participant is defined as someone (such as a friend or spouse of a rider) who participates in BAM but who chooses to drive a vehicle instead of bike. RVs are not allowed. Non-rider participants must pay the full registration price of $325 and are subject to the BAM Cancellation Policy. Cancellations: Riders who cancel by June 24 will be refunded the entire ride fee less $50. Riders who cancel after June 24 will forfeit the entire ride fee unless BAM can find a substitute rider from its waiting list, in which case the rider will receive a full refund less $50. If you have questions, please contact BAM via email. Trip Cancellation Insurance: You may wish to purchase trip cancellation insurance to protect yourself in case you need to cancel. RVs and Support Vehicles: Due to safety and state permitting reasons, RVs are not allowed at the campsites or on the route, nor are support vehicles allowed on the route. Minors on BAM: BAM has established a ride policy which limits the ride to persons 16 years of age or older. Riders 16-17 years of age must be accompanied by a responsible adult during the ride, preferably their parent. A medical release form for each rider 16-17 years old must be signed by his or her parent or guardian. The minor must have the form in his or her possession at all times during BAM. Without the release form, there could be a delay in any necessary medical treatment. Pet Policy: While we’re sure Rover would have a great time on this ride (as will you, we hope), unfortunately for safety reasons, he/she will have to resort to stories and photos, as pets are not allowed. Riders with pets on the ride will be asked to leave the ride, with no refund of registration fees.